Laying in a hospital bed, Pat Duffy, just 16 years old, was awoken by an assistant for his routine check. Duffy lifted his washcloth from his forehead and asked the assistant to wet it, the only thing to distract him from the pain. The assistant obliged and then placed it on Duffy’s forehead. By the end of his stay, Duffy didn’t need to ask the assistant, because the assistant knew what Duffy wanted. “Those kind of things — you don’t see that in a normal hospital. It’s different,” Duffy said. This kindness is not only why Duffy is now a fifth-year physician assistant student; it’s also why he dances for the kids. 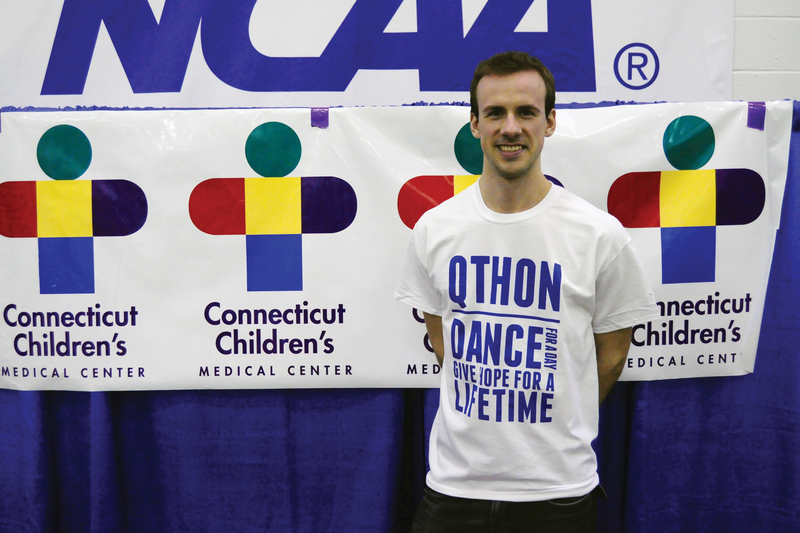 Duffy, a former member of Delta Tau Delta, spoke toward the end of QTHON, the school’s third annual dance marathon, sharing his experience with Connecticut Children’s Medical Center and why it means so much to him. Duffy had surgery at the Connecticut Children’s Medical Center for a pectus excavatum, a condition in which a person’s breastbone is sunken into his or her chest, according to the Mayo Clinic. “It’s an indent of the chest,” Duffy said, pointing to his chest. Pectus excavatum is found in one in 600 to 2,000 newborns. It is caused by an overgrowth of cartilage between the ribs and sternum according to WebMD. The surgery consists of putting a metal bar in his chest to bend out the sternum. Duffy underwent his surgery in December 2007 and stayed in the hospital for what he described as six painful days. Duffy was told to not engage in physical activity for three months, which kept him from playing football in gym class and had other people help him carry his backpack to and from classes. He still felt pain after three months, but was able to play golf on April 20, 2008, and the next day, he played football, tennis, and ran around. On April 22, he was admitted to the emergency room for hemothorax, also known as internal bleeding. Duffy didn’t need surgery and had stayed for only three days, just feeling weak. When thinking about a career, Duffy had a variety in mind including a history teacher, an engineer and a lawyer. But Duffy’s surgery was in the back of his mind. His initial feeling about working in hospitals was that he hated it. He then started thinking about all those people who reached out to him at his time at CCMC. Duffy researched physician assistant, after shadowing one at a Hartford hospital, he knew what he wanted to do. He thought back to his stays at CCMC and reflected on the care he received. Different nurses would come to Duffy’s room to see how he was doing even if he wasn’t their patient. The UConn women’s basketball team came and he got all their autographs. He recalls the nurse, Kerry, who went out of her way to make Duffy comfortable before his operation. Even the assistant with the washcloth factored into Duffy’s decision. “That meant a lot to me because he remembered who I was, he remembered that that really helped me, that’s all I really wanted and he took the initiative to do it,” Duffy said. It became an easy decision for Duffy to major in becoming a physician’s assistant. In February 2012, Delta Tau Delta brought QTHON to the university. Members went and took a tour of the hospital, and Duffy told his brothers why it meant so much to him. AJ Billingsley, QTHON co-chair and Delta Tau Delta member, was touched by Duffy’s experience. “QTHONstarted when we were juniors and the experience at the hospital and how they saved [Duffy’s] life time and time again really came in clutch with our fraternity trying to make sure we had the full support of everyone. From there, it just took off,” Billingsley said. Duffy was seen dancing and high-fiving people throughout the entire night. Burt Kahn Court blasted with music as students from a variety of organizations danced together while wearing the white and blue QTHON T-shirts. The a six-hour dance marathon raised more than $30,000 to the hospital, which means a lot to Duffy.